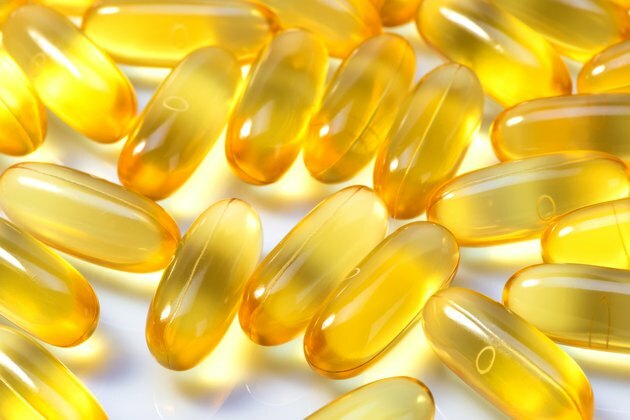 Your physician may recommend that you take fish oil capsules if you have high cholesterol levels, particularly the component of cholesterol known as triglycerides. These fatty substances can cause your circulatory system to become blocked, or the build up of them may narrow your blood vessels. Omega-3 polyunsaturated fatty acids are present in fish oil capsules, as well as in various foods. Some people may experience side effects of taking these fish oil pills. You may get a rash on your skin when you start your omega-3 fish oil supplement regimen. Your skin may itch and appear reddened. Drugs.com indicates a skin rash generally will appear as a mild and temporary condition. Your body may need to become adjusted to having omega-3 fish oil in it. While this adjustment period takes place, the ingestion of omega-3 fish oil may cause you to break out with this mild rash. Although rare, fish oil can cause you to have a severe allergic reaction to it that also may cause hives, a type of rash. If you get these tiny raised red bumps, seek medical attention immediately. The milder form, the rash, occurs much more frequently and physicians expect it to cease on its own. Omega-3 fish oil capsules may produce the temporary and non-serious side effect of pain. This usually occurs in your back, Drugs.com indicates. The pain should occur as a minor if uncomfortable problem when you begin taking the capsules, but should fade and end on its own without medical intervention. If the pain feels severe, or if it lingers beyond your initial use of omega-3 fish oil, talk with your doctor about it. You may have a more severe reaction to the supplement, or you may have another physical problem developing apart from the fish oil. Your doctor can determine why back pain occurs and continues. Common to a variety of health supplements, omega-3 fish oil may cause you to experience a bad taste in your mouth. While you need to swallow the capsules whole, once they begin to digest, they can produce this unpleasant taste in some people. Drugs.com indicates a bad taste associated with omega-3 fish oil capsules does not classify as a serious problem. It should stop by itself. However, you should consult your physician if it continues or severely affects you. She may have some advice to overcome the bad taste or may recommend a different way for you to get sufficient omega-3 polyunsaturated fatty acids into your system.